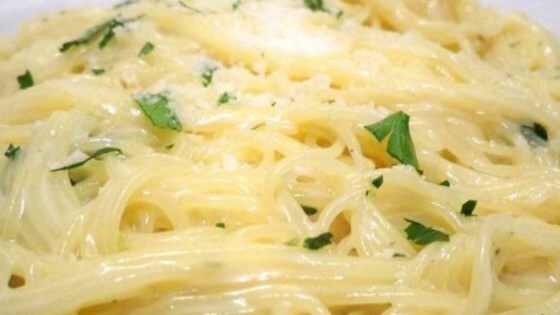 "Best garlic pasta I have ever had. Add prawns and/or scallops to make an amazing seafood Alfredo." Heat olive in a medium pan over medium heat. Add garlic and stir until fragrant, 1 to 2 minutes. Add butter and stir constantly until melted. Pour in chicken broth; add pepper and salt. Bring to a boil. Add spaghetti and cook, stirring occasionally, until tender yet firm to the bite, about 12 minutes. Add more chicken broth if pasta starts to stick to the pan. Stir Parmesan cheese, cream, and parsley into the pasta and mix thoroughly. Serve immediately. Watch how to make this deliciously simple dish. AWESOME! No changes! Going to try with chicken. Delicious recipe! I used all four cups of chicken broth while preparing the recipe , and I added capers and grilled chicken on top before serving. This turned out well. I used 2% instead of cream and it worked. I will add more garlic next time. This turned out great!! I added a bit more cheese ,basil, and grilled some salmon on the side for a quick Sunday dinner. My family luved it!! Took quite a bit of time for the sauce to thicken, but excellent flavor.